To get where you’ve got to today. You’ve come a long, long way! Remember those commercials with all those hip, modern women in their midi skirts and Gloria Steinem glasses? I think they may have even used images from Chisholm’s presidential run. The result of Madison Avenue’s nod to women’s rights was that the rate of 12-year-old girls starting to smoke increased by 110 percent! That’ll teach ‘em to want equality! 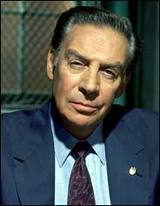 Another person who died this weekend who brings me back to the 1970s is Jerry Orbach. I never watched “Law and Order” so I remember Orbach best as shyster lawyer Billy Flynn in the original cast of Bob Fosse’s “Chicago” which I saw on Broadway in 1975. One weekend my friend Helena and I took a Greyhound bus 17 hours from Chicago to New York, saw a matinee of “Chicago” with Jerry Orbach, Gwen Verdon, and Chita Rivera, and then hopped back on the Greyhound for the 17-hour trip back to Chicago! Yikes, we were young then but we thought it was well worth it to see those guys. Orbach was the perfect Billy Flynn—and I’ve been forced to compare all subsequent Flynns to that amazing performance. I also have some vague memory (that just this second came back to me) of catching a rose that Chita Rivera threw to me during the closing number of that show. Little did I know that thirty years later my ten-year-old daughter would be doing a solo of “All That Jazz” at a recital and that she’d know the words to every song in that score. I guess this is the time of year when everyone talks about the famous people who have died during the previous year. The ones I most remember are Julia Child, Marlon Brando, Ann Miller (Kendall and I had several fab encounters with her! ), Tony Randall (my sister, Kendall, and I went to his memorial tribute in New York which was the best show in town), Janet Leigh (Kendall and I saw her on our first date! ), Christopher Reeve, Howard Keel, Ray Charles (we live on the same block as his recording studio), and Carrie Snodgress (whose “Diary of a Mad Housewife” probably did as much for women’s rights as Shirley Chisholm’s campaign!). 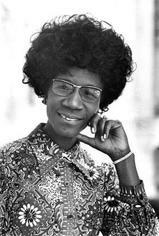 SHIRLEY CHISHOLM I WILL ALWAYS LOVE U TO DEATH EVEN THOUGH U ARE NOT HERE WITH US I WONT EVER FORGET ABOUT U...... U ARE MA ROLE MODEL IN MA LIFE TO LET ME KNOW I NEED TO MAKE MA LIFE A SUCCESS....AND THAT I DONT NEED TO BE WASTING MA LIFE ON NONE SINCE...I AM ONLY 13 YEARS OLD.... SO I PLAN ON MAKING MA LIFE A SUCCESS. Wow, I didn't know that another woman had once run for president. Where was that in the history books I was forced to read in school? I bet they left it out on purpose. Man, she must have had a lot of guts back then and I can only imagine the talk that ensued during the campaigns. I'm hoping that Hillary gets elected next year, if only to make history. I was talking about it recently to a friend of mine who insisted that "we're not ready for a female president." Au contraire! I think we are more ready now than we were back in '72. At least I should hope so. What's that show on the air now starring Geena Davis as a female president? I read once something about that show preparing the country for what's soon to come. Even if Hillary doesn't win, it will always be remembered as a historic event in my mind.